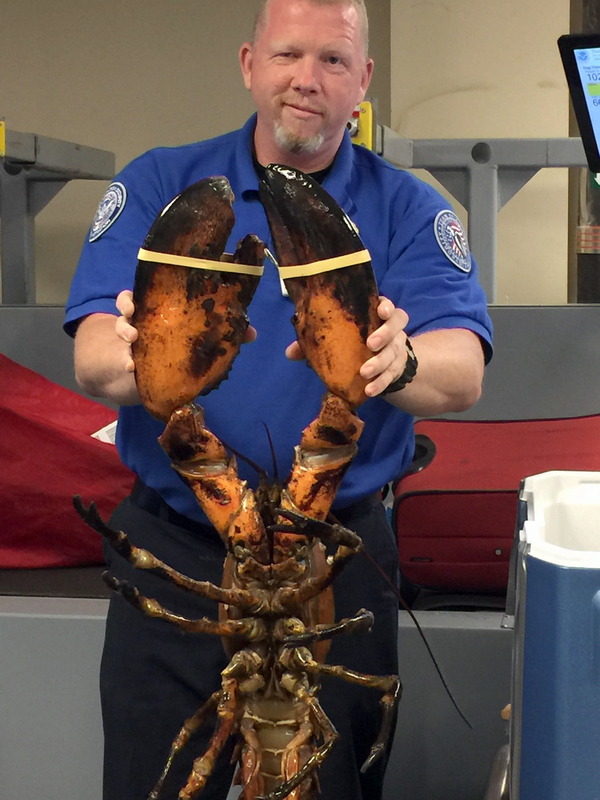 Security services at Boston’s Logan International airport are trained to spot contraband in passenger luggage – everything from sharp objects to drugs – which is probably why the discovery of a 9kg live lobster came as a bit of a surprise. Michael McCarthy, a spokesman for the Transportation Security Administration, says the lobster found on Sunday in a passenger’s checked luggage is the largest he’s ever seen. Judging from the picture, this statement probably shocks no one. Oddly enough, a whopping great big lobster like this one is actually allowed to be taken on planes – good to know next time you want to carry a huge crustacean of your own across the world. The TSA website says a live lobster is allowed through security but must be transported in a “clear, plastic, spill-proof container”. However, the problem with this particular lobster was that it was snug in a cooler bag instead of a clear, plastic container. Luckily, McCarthy says it “cooperated quite nicely with the screening process”. McCarthy posted the picture of his new buddy the lobster on Twitter, and people have a lot of questions and thoughts about it. Did they have to pay for its own seat? So is that a liquid or a gel? OMG, that thing is huge!! I will bring the butter ! But don’t worry, because these darker comments were qualified by some terrible jokes. They shoulda let him ride First Claws. … I'll show myself out. No word yet as to the lobster’s final destination.